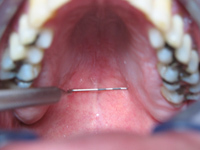 Velscope is a new tool for oral mucosal examinations. It is a hand held device that provides dentists and oral health care professionals with an easy to use examination system for the early detection of abnormal tissue. It is used as an adjunctive aid in combination with traditional examination procedures. The Velscope uses a fluorescence visualization technology. The system emits a safe blue light into the oral cavity. The Clinician is then able to immediately view the different fluorescence responses to help differentiate between normal and abnormal tissue. 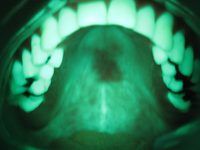 Under examination with the Velscope System, abnormal tissue typically appears as an irregular, dark area that stands out against the otherwise normal, green fluorescence pattern of surrounding healthy tissue. It is a painless, non-invasive and requires no rinsing or stains. Why should you have a Velscope screening? Your Dentist or health care professional may be monitoring a suspicious area/lesion in your oral cavity. Incident of oral cancer increased to 11 % in the United States in 2007. Unlike several other cancers the survival rate for oral cancer has remained unchanged for decades. Early detection of oral cancer has a better survival rate. Oral Cancer occurs in those over the age of 40. Prolonged exposure to ultra violet radiation (Sunlight). Early screening, diagnosis and treatment planning saves lives! For more information ASK your Dentist.